A few weeks ago as we entered the Lenten season, my 3-year-old heard someone mention Easter and immediately started chattering about chocolate bunnies, easter baskets, coloring eggs, and pretty dresses. She remembered all these things about Easter from last year. While eggs and bunnies are a fun tradition, it is far more important for my children to know the reason we celebrate Easter. As a family, I want to ensure we are keeping Jesus’ death and resurrection at the center of our celebrations and observances. Do you find it difficult to talk to your children about Jesus? Many parents admit that although they'd like to talk spiritual matters with their children, they don't quite know how to bring up the topic outside of church or sunday school. One way we open up Biblical conversations with our children in our home is through books. My children are total book worms and we seem to have more children’s Bibles than we can count! Here are a few of my favorite Bibles for children (and one for teens). If you’re struggling to start spiritual conversations with your kids, maybe give one of them a try! 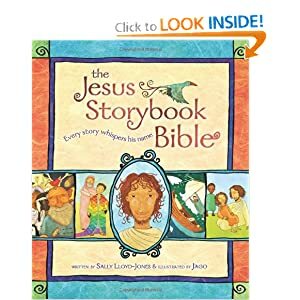 The Jesus Storybook Bible combines whimsical artwork with simple, descriptive language that appeals to a child’s imagination. Jesus, referred to as our “rescuer,” is sent by God to make “everything sad come untrue.” The best part about this Bible is that every single story ends with foreshadowing pointing directly to Jesus. Also, right now you can purchase the kindle version for only $1.99! “If you were really the Son of God, you could just climb down off that cross!” they said. And of course they were right. Jesus could have just climbed down. Actually, he could have just said a word and made it all stop. Like when he healed that little girl. And stilled the storm. And fed 5,000 people. 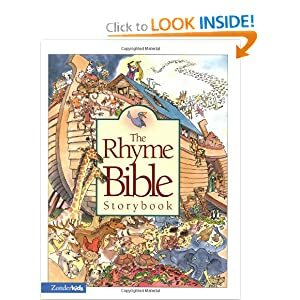 The Rhyme Bible Storybook tells the stories of the Bible in short, catchy rhymes, each one accompanied by a picture. 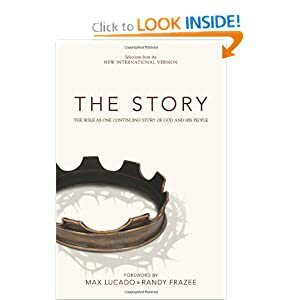 This Bible is so easy to read and the stories move so quickly that you may find yourself relenting to “just one more story!” and another one after that! The Beginner’s Bible doesn’t waste a lot of time on excessive description. 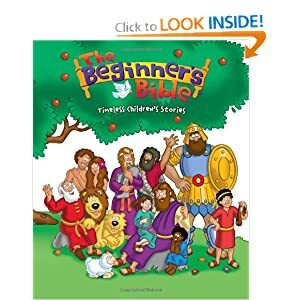 Simplified Bible stories are short and to the point, accompanied by large pictures on every page. Perfect for little ones and short attention spans! For parents of older children, The Story is a perfect way to read the Bible with your teenager. As the title suggests, The Story arranges scripture into one continuous story, divided into chapters. Add the devotional worksheets and dvd that narrates the story accompanied by some awesome live stop-motion art and this book becomes a perfect resource to start conversations about Jesus with teenagers. What is your favorite way to talk to your children about Jesus? Do you have a favorite children’s Bible? P.s. “Happy” Good Friday everyone! I feel so emotionally “mixed up” on Good Friday, like I am simultaneously experiencing both ends of the emotional spectrum. On one end, I am deeply saddened as I reflect on our Savior’s death and MY sins that put him on that cross. On the other end, I have the hope and assurance of his resurrection. I know that come Sunday, I will exclaim “He is Risen!” with nothing but joy. What an terrifying yet reassuring day Good Friday is! I hope you are able to make it out to a church service this afternoon to reflect and pray about what Jesus has done for us!